Buying an investment condo on the beach is one of the most rewarding decisions for investors. The prospect of owning a piece of paradise that pays for itself and potentially earns you extra income is highly appealing. Plus, you will own your own private vacation retreat on the beach! 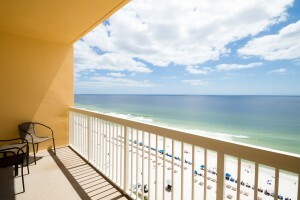 One of my all-time favorite Panama City Beach condos for investors is Calypso Resort and Towers. 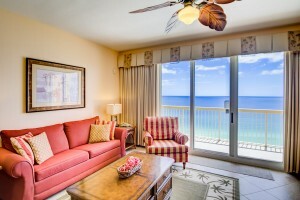 Calypso’s ideal location on the west end of Panama City Beach makes it an extremely popular choice for vacation rentals. It is close to Northwest Florida Beaches International Airport and adjacent to the area’s most popular shopping, dining, and entertainment epicenter, Pier Park. Located in Calypso’s desirable West Tower, Calypso unit #2-1103 is a must-see for anyone looking to buy a rental investment, second home, or even a primary residence on the beach. This eleventh floor unit has a well-established rental history, and boasts some great features! The condo is equipped with a Coastal Green Air Energy Saving System for the A/C unit and the water heater. Door and motion sensors detect when the unit is occupied, lowering water heater use while the unit is vacant and turning off the A/C when doors are left open to maximize energy efficiency and lower the electric bill. Other interior upgrades include 1″ black granite countertops in the kitchen and bathrooms, and custom tile floors throughout. Calypso unit #1103W is tastefully furnished with a subtle tropical theme, which is popular with guests who visit Panama City Beach for an authentic beach vacation. The master suite features a king size bed and a full en suite bath offering. A hall bunk and full size sleeper sofa sleep an additional four guests. There is an additional full bath in the hall. Breathtaking Gulf views are visible from the kitchen and living/dining area, as well as the spacious private Gulf front balcony. On a cool morning, open the sliding glass door to invite the refreshing Gulf breeze in while you enjoy a morning cup of coffee before a memorable day at the beach. A stackable washer/dryer combo in the unit is a welcome convenience after a long day playing in the sugar white sands and emerald green waters of the Gulf. Calypso Resort and Towers boasts some of the best amenities in Panama City Beach. Spend a lazy afternoon lounging on the spacious pool deck sipping on beverages from the Tiki Bar, make a splash in one of the two Gulf front lagoon style pools (one of which is heated seasonally), or walk a few more steps down to the beach for an afternoon collecting shells and frolicking in the emerald green waters. Calypso also offers a fitness center and game room. These first-class amenities create great demand for rentals at Calypso. Call Craig Baranowski @ 850.259.1788 for more info or to schedule your private showing! What is the price for the 1 bedroom at Calypso #2 1103 please?